Ancient Vediv Religion Festivities of Bihar are steeped in history that has no means to fathom. Moreover, history is not always written by historians but by people who ake up legends. and legends to the skeptics are in fact revelations to the faithful. At one time Bihar was beyond the pale of Aryan culture and remained free fro the influences of Vedic religion. During this period, the people of ancient Bihar worshipped the forces of nature, like serpents, stones, trees, Chaityas (funerary mounds) Yakshas (semi divine beings), etc. Gradually these objects were incorporated into the Aryan pantheon and in exchange Brahmana leadership and Vedic sacrifices were accepted by the people of this region. The majority of people are Hindu. So all traditional Hindu festivals are observed - Holi, Saraswati Puja, Durga Puja or Dusserah, Deepavali, Bhaiya Dooj etc. But there is one festival that is uniquely associated with Bihar, and that is the festival of Chhath. Christians, although proportional to the whole population a small minority, are very large in absolute numbers. Many beautiful Catholic and Protestant church buildings dot the landscape of towns in Bihar. Special mention may be made of Patna and Ranchi. Some examples are: the St. Joseph's Convent, the St. Xavier's School with its chapel, Padri-Ki-Haveli, and the church at the Holy Family Hospital in Patna; and the Gossner Evangelical Lutheran Church at Ranchi. Surprisingly, Bihari Sikhs, in the land that gave the tenth guru, Guru Gobind Singh, are very few in number. A large number of Sikhs from the Punjab migrated to Bihar during the partition of India in 1947. This uprooted, but highly enterprising, group of people quickly established itself as very successful member of the business and industrial community in Bihar. They are now an integral part of the Bihari population. The Harmandir Takht, the gurudwara that commemorates Guru Gobind Singh, is a sacred place of pilgrimage for the Sikhs. To the Sikhs this holy place is reverentially known as Patna Sahib. The amalgamation of Vedic and non-Aryan religion was not an easy affair. It is not surprising to find the Rig Vedic word for festival, Samana, which has been rendered both as ‘battle’ and ‘ ‘festival’. We hear of Bhima and Arjuna as destroying the great Chaitya on the hills of Rajgir in order to demonstrate their hostility towards Magadha. Likewise, the Asurs of Gaya were uprooted by Vishnu. The famous Sonepur Cattle fair (deeed to be the largest in the world) recreates the Gagendra moksha legend, associated with Hariharanatha temple in Sonepur, which was once strongly opposed to Vishnu. The Cattle fair, beginning with the full moon day of Kartik Purnima (November) commemorates the ancient concord accommplished at Sonepur, between the opposing sects of Vishnav and Shiva worshippers. The central venue is the kaun hara (who lost ?) ghat (river bank) which originates from a mythical encounter between the honest gaja elephant) and the shrewd graha (crocodile). The story dates back to the undatable past when the elephant. Jai and the crocodile, Vijai in their previous birth were fraternally related devotees of Lord Vishnu. Once they quarreled amongst themselves over the distribution of proceeds received from a fire sacrifice. Jai, the elder, cursed the younger Vijai for reneging on the promise of equal shares, while Vijaia insisted that each of them were given what they deserved and so there was no question of sharing it. For Vijai, the curse spelled rebirth as a vile crocodile. In retaliation the younger cursed the elder to be reborn as an elephant. When the anger subsided, the two brothers realised thir mistakes but the curses were irrevocable. Later, one Kartik Purnima day when the saintly elephant went to the Gandak river for a bath, the crafty crocodile caught his foot. A fierce battle ensued and finally Lord Vishnu had to hurl his disc to kill the crocodile. The Hariharanatha Temple at Sonepur, housing the images of Vishnu and Shiva, commemorates the temporary thaw in what was otherwise a more or less permanent war between themselves and their supporters. Legend apart, the famous Sonepur fair in more of a cattle trading centre where incredible number of birds and cattle are brought from different parts of the country. Besides, the bewildering array of wares are on sale and add to this the numerous folk shows about which the BBC once remarked, "there’s nothing like the Sonepur Cabaret." The time to start is very early in the morning when the fog is suddenly pierced by the sun and the huge gathering has just emerged from the holy dip in the cold absolving waters. The mela that lasts upto a fortnight, provides enough time to talk to the parrots, watch the elephants being bathed leisurely, followed by ear splitting trumpets and then the artists working up with colourful designs to decorate the elephants as if the pachyderm has been tatooed all over, see the horses being tested for their speed and stamina, big bulky buffaloes being milked and likewise all other animals demonstrating their skill, strength and productivity. By midday, it is the cacophony of strong decibels pouring in from all corners as the huge gathering becomes denser with more and more people adding to the sound and sight of the landscae. Ash smeared, saffron clothed holy men blow their conches and bang their gongs. Loudsspeakers, from various folk shows and jugglers rent the air together with the unison from the animals. Much before the sun sets in, flames and fumes of dung fire burning at different places appear to screen the sky in a very amusing way, as if some mediveval army has just camped for the night. and it is time to share a gossip with one of the villagers who may better summarise the stock and sale of the cattles for the day. Zesty snacks together with tea comes in from the open air restaurant. The rainy month of Sravana when there is danger of death from snake bite, people appease the snake god by offering milk during Nag Panchmi. The prime centre of naga worship is Rajgir and Mahabharata describes this place as the abode of serpents and excavations have revealed numerous objects used in serpent cult. In fact naga worship is wide spread through out India. Famous Makar Sankranti mela is another festival unique to Rajgir in the month of Paus, corresponding to mid January. Devotees make flower offerings to the deities of the temples at Hot springs and bathe in the holy water. Another historic place associated with fifteen day long Makar Sankranti mela is the Mandar hills in Banka district. Puranic legends accounts for a great deluge which witnessed the creation of a Asura that threatened the gods. Vishnu cut off the Asura’s head and piled up the body under the weight of the Mandar hill. The famous panchjanya - the sankh (counch shell) used in the Mahabharat war is believed to have been found here on the hills. Traces, akin to serpent coil can be seen around the hill and it is believed that the snake god offered himself to be used as a rope for churning the ocean to obtain the amrit (nectar). Gaya is another holy dot in Bihar, famous for the International Buddhist Gathering and the rallying point is the Mahabodhi tree and the adjacent temple. The occasions are Buddha Jayanti (Buddha was born on this day, he attained enlightenment on this day and also attained Nirvana on this day ) and in the month of Vaisakh (April/May) and the annual session of Dalai Lama in December. Mahavir Jayanti is celebated in April with much fanfare on the Parsvanath hill and also at Vaishali while Deo Deepawali, marking the attainment of Nirvana by Mahavira is celebrated best at Pawapuri, ten days after Deepavali. Arond september the sleepy town of Gaya is agog with people who come here for the famous Pitrapaksha mela or the ancestor worship typified in Sraddha ritual. It is time for the Gayalis (the descendants of Magga Brahmans who were once devotees of Shiva but later converted to Vaishnavism) to be prepared for the vedic Sraddha ceremonies or the pindan - a mandatory Hind rite that is supposed to bring salvation to the departed soul. In the early Dharmasastras, Vishnu provides a list of over 50 tirthas but it proclaims that dead ancestors pray to God for a son who would offer pinda (lymph of rice) to them at Gaya. The tradition traces its history to the time of Buddha, who is believed to have performed the first pindan here. Turning the pages of earlier history, one comes across the Puranic legend that ascribes Gaya as one of the holiest spots of the world. The Asura, named Gaya become so powerful that the gods felt threatened and thus thought of eliminating him. As a precondition to his death, the Asura demanded that be should be buried in the holiest spot of the world. This place is Gaya. The central point of the Hindu pilgrimage in Gaya is the Vishnupada temple built by Rani Ahilyabai of Indore in 1787. The spot on which it stands is associated with the famous mythological event of Vishnu killing Gaya and leaving his footprints on the rock which is the main point of worship in the temple. The Shraddha is customarily performed under a fig tree while the women pilgrim perform it indoors as gayawal women live under strange customs, for instance, they never stir out of the house, married girl continues to get her daily ration from her parents. They can adopt a child or even an adult, who may assist her in their work. The Gayawals are believed to maintain centuries old records of the pindans performed under the supervision of their ancestors and accordingly people prefer the specific family of Gayawals who might have served their ancestors as well. Though Bihar is in league with festivals like Holi, Dussehra, Deepavali but chaath puja (6 days after Deepavali) is Bihar’s prime festival honouring the sun god. Unlike the zestful Holi or the expensive Deepavali) Chaath is a festival of prayer and propitiation observed with solemnity. It is an expression of thanks giving and seeking the blessings from the forces of nature, prominent among them being the Sun and river. The belief is that a devotee’s desire is always fulfilled during Chaath. Simultaneously an element of fear is alive among the devotees who dread the punishment for any misdeed during Chaath. The city remains safe during this time when criminals too prefer to be a part of the good. Chaath in Bihar can best be seen at Deo in Aurangabad or Baragaon near Nalanda, noted for their sun temples. Unlike other sun temples in India that faces East, the temple at Deo faces west and during the festival time it is the most crowded place. It is strange to see a Brahmin standing in the river water next to a Harijan ! The festival is more of a sacrifice which entails purificatory preparation. It can be performed by men or women, irrespective to caste or creed. Chaath commences with the end of Deepavali when the house is thoroughly cleaned, family members go in for a holy dip, strict saltless vegetarian menu is observed (even onions and garlic are considered unwanted during the entire festival period), all earthen vessels are reserved for the period only and all possible purity of food is adhered to; clothes have to be unstitched and people sleep on the floor. The person observing the Chaath (known as Parvati) observes dawn to dusk fast which concludes with sweets. This is followed by another fast for 36 hours till the dawn of the final day when puja commences at the river bank much before sunrise. The disciplined parvatis remain in water from late midnight until the ray of dawn streaks the horizons. 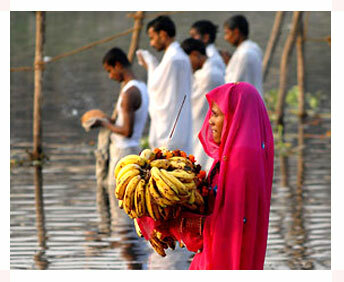 The river is now flooded with offerings to the sun which is followed by breakfast and distribution among the gatherings. What once used to be the debating ground scholars debating ground in Mithila has now become saurath Sabha or the Mithila marriage market near Madhubani. In the summer of June, Mithila Brahmins prefer to gather in the vast mango grove (thanks to the Raja, Raghav Singh, the Mithila ruler of Darbhanga for gifting the land for the ever gathering crowd of Mithila matchmakers) in the village of Surath to explore the possibilites, discuss horoscope and finally to negotiate marriages within the community but atleast five generations beyond the family. The girl’s father is on the move trying to locate a prospective bridegroom and so in the Ghatak (middleman), all the more serious to earn commissions on marriage fixtures. Once the prospective families pass through the ordeal of question session and feel satisfied by the initial scrutiny of the horoscopes, they move on to the Panjikar (registrars) who verifies the records and credentials to ensure that matrimontial alliance was not being performed within the prohibited degrees (within the seventh generation on paternal side and the fifth on the maternal side). His satisfaction earns a talpatra (palm leaf certificate) marked in red symbolising ‘no objection certificate’ which permits the families to establish matrimonial alliance. The Panjikar too receives a token and he blesses the girl’s father, " May your daughter bathe in milk and bear many sons." The successful families finally call off the day with a visit to the nearby Shiva temple.